When you're getting paid to promote the Google Pixel 2 XL, don't use your iPhone. It’s happened often enough now that it’s a thing: A celebrity is paid to gush about how much they love an Android device but they make their Twitter posts from an iPhone. It’s a black eye for Android because it makes it clear which phone the celebrity really likes. 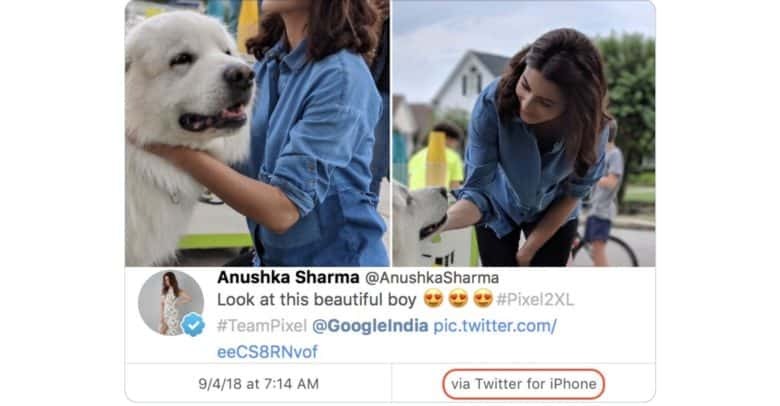 The latest example is from Bollywood actress Anushka Sharma. She’s being paid to gush about Google’s Pixel 2 XL, and she posted on Twitter several pictures supposedly taken with the device. However, YouTube star Marques Brownlee noticed that her post was made by Twitter for iPhone. Part of what makes Sharma’s mishap funny is this sort of thing happens all the time. Oprah Winfrey and Gal Gadot are just some of the celebrities who have been caught using an iPhone or iPad to make paid advertisements for Apple rivals. Time for a quick public service announcement: Celebrities, if you’re being paid to make Twitter posts about a smartphone, make the posts from that device. We can tell. And one for advertisers, too: You can pay a celebrity to say something, but you can’t make them mean it. By contrast, Apple doesn’t pay the rich and famous to post about how much they love their iPhones. It doesn’t even give them free devices. Clearly, Cupertino doesn’t have to.